layers to elicit such complex flavor profiles, such as is done in Ramen or Pho. But this dish couldn’t be further from the idea of long hours toiling away in the kitchen. One bite and you’ll be truly amazed that this entire dish can be on the table in about 40 minutes. Prior to making this dish, I had never actually had Khao Soi. Being a frequent patron to Thai restaurants, I’m a bit surprised that I have never even seen this on any of their menus – to include the authentic establishments. 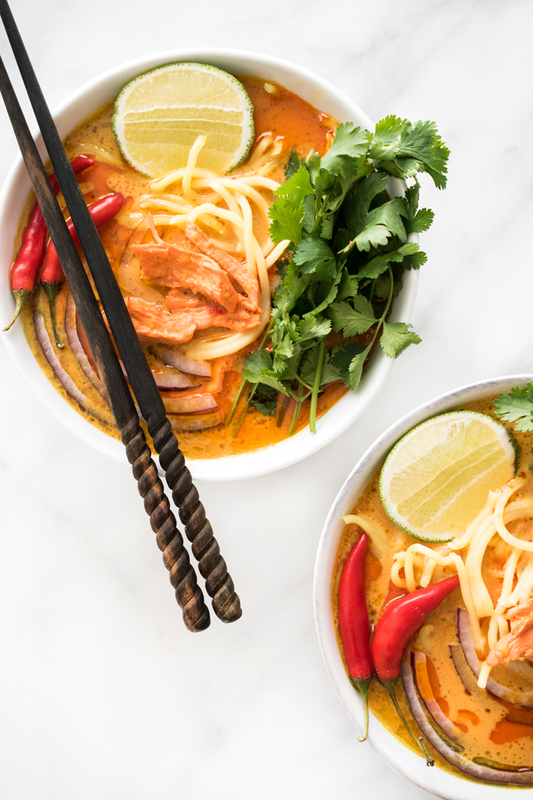 From what I understand, for a truly bona fide bowl of Khao Soi, it’s going to take you about 2 hours – time that involves toasting aromatics and going old-school-style with a mortar and pestle to extract flavors. I honestly cannot speak to the traditional method of preparing this dish and whether or not the same flavors can be replicated using an abbreviated recipe. 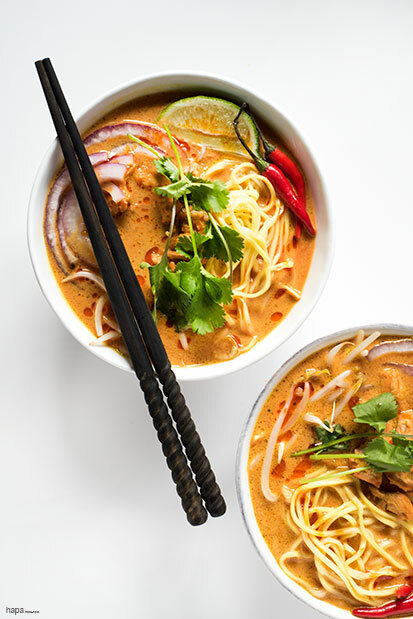 But what I can tell you is that this Spicy Thai Curry Noodle Soup is rich, creamy, and packed with complex and bold flavors. There are two main types of turmeric powder: Light yellow Madras turmeric is most commonly available and is used primarily for curries, pickles, and mustard; Alleppey turmeric is darker in color due to a higher portion of curcumin (turmeric’s coloring agent) and is noted for its fine flavor and earthy aroma with delicate notes of lemon and mint. Chances are the turmeric powder you purchase at the store will not indicate what type of turmeric is inclosed. But what I can tell you, is that I bought turmeric from two different stores, both varying in color, and both dishes turned out great! So don’t stress too much over it, unless of course you really want that deep orange color as are in the photographs above. Speaking of color – I should mention that turmeric is often used as a dye and like dyes do, it will stain anything it touches – to include your fingers. The color fades after repeated washes, but just be aware in case you’re wearing your favorite white sweater while enjoying this incredible dish. This bright and beautiful soup has incredible depth of flavor. You'll never believe how quick and easy it is to make. Prepare lemongrass water by, placing the thinly sliced lemongrass in a small bowl, then pour ½ cup of boiling water over it and allow to steep for at least 10 minutes. Then remove the lemongrass, reserving the water. Puree the chilies, shallots, garlic, ginger, cilantro stems, coriander, turmeric, curry, and 2 tablespoons of the lemongrass water. Process until smooth, add more lemongrass water, 1 tablespoon at a time, if needed. In a large pot over medium heat, warm the vegetable oil. Add the spicy curry puree you just made, and cook 4-6 minutes, stirring constantly. Add the coconut milk and broth. Bring to a boil and add the chicken. Reduce the heat to a simmer and cook the chicken until fork-tender, about 10-15 minutes. Transfer the chicken to a plate and allow to cool slightly, then shred the meat. Add the fish sauce, sugar, and chicken to the soup. Season with salt, if needed. Divide the soup and noodles among bowls and serve with the desired toppings. Enjoy! This is now a staple in our house. Absolutely delicious. I add a couple of big balls of sticky rice to teenage boy’s bowl as he is a bottomless pit. Can we make this with udon noodles? Hi Nad! I’m so sorry for my super late response! My husband and I recently moved across the country with a newborn (due to an unexpected job change) and we’ve been in temporary housing while we look for a new home – yada, yada… it’s been a little crazy around here 🙂 In any event, you may have already given this a try, but yes! Udon noodles will work. Cheers! Yes I made it and it was delicious. Thanks for your reply and the yummy recipes. Good luck with the newborn and the moving. 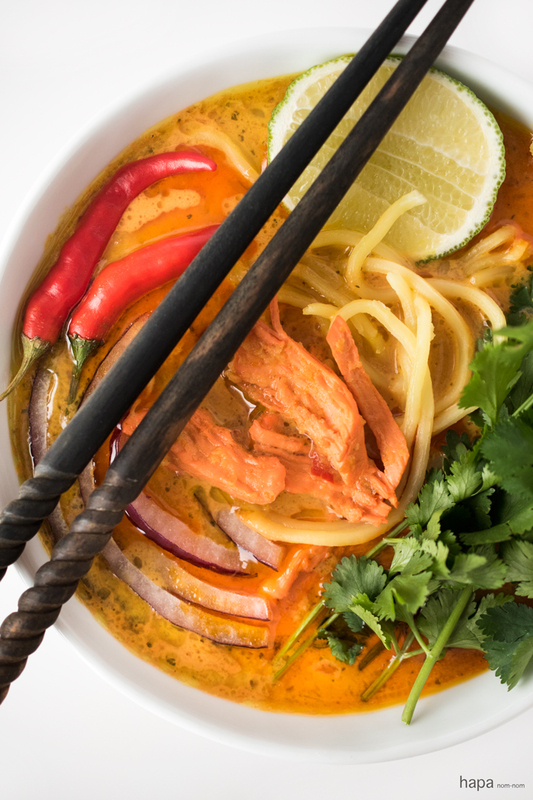 I was so excited to make this…craving some Thai noodle soup without msg. Was I supposed to use red curry? This tasted like Indian curry. Hi Sommer! Thai curry and Indian curry do have some of the same ingredients so there are some similar flavor profiles. 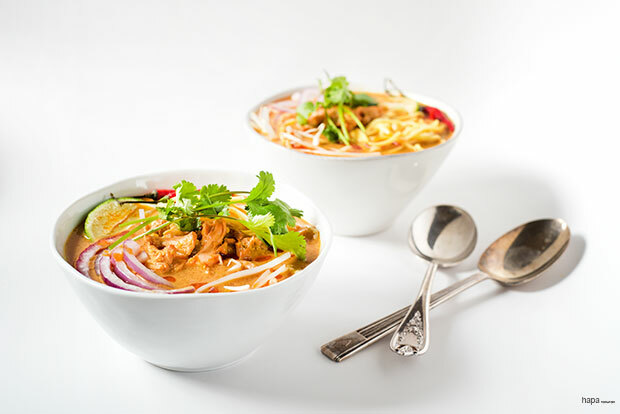 Generally speaking though, Thai curries tend to use more fresh herbs and are cooked quickly, whereas Indian curries tend to use more dried spices and are slowly cooked. If you’re looking for more of a red color (as in the photos), I mention in the body of the text that there are a couple of different types of turmeric: There are two main types of turmeric powder: Light yellow Madras turmeric is most commonly available and is used primarily for curries, pickles, and mustard; Alleppey turmeric is darker in color due to a higher portion of curcumin (turmeric’s coloring agent) and is noted for its fine flavor and earthy aroma with delicate notes of lemon and mint. Chances are the turmeric powder you purchase at the store will not indicate what type of turmeric is inclosed. But what I can tell you, is that I bought turmeric from two different stores, both varying in color, and both dishes turned out great! So don’t stress too much over it, unless of course you really want that deep orange/red color. This soup is EVERYTHING! Just complicated enough to give an awesome depth of flavor, but not take all day. I’ve made this multiple times and always get rave reviews from friends. Next up, I’m making it (again, by special request) for our work Noodle Potluck! That’s fantastic, April! I’m so glad you enjoy it as much as I do! And a noodle potluck sounds like my kinda potluck! YUM! This soup looks amazing, Kathleen! Wow! Deep flavor in the broth but not terribly spicy. (I only added 2 chillis) I’ve never had this soup either home made nor going out but it’s fantastic!!! I have to do gluten free for my son and myself, do you think rice noodles would work just as well? Absolutely! I hope you and your son enjoy! I came across your blog and this recipe through Nagi at Recipetineats – and wow. Just wow! My new favourite soup is born. What an incredibly easy recipe and that home made curry base is just perfect. I used three small chillies, seeds and all, and it was perfect. I squeezed a whole lime into the soup before serving as I wanted it to be that bit more balanced before adding even more at the table to brighten it up! I upped the noodles to 750gm (1 1/2 pounds) to get six serves out of it. I can’t wait for my lunch today and I even woke up thinking about the flavours. Thank you so much for sharing your wonderful recipe! Hi Beck! Isn’t Nagi just wonderful?! She’s every bit as lovely in person as she is on her blog! Thanks so much for the note and I’m so glad you enjoyed the recipe! It’s one of my favorites and even though I’ve made it a hundred times, I’m still impressed with the level of complex flavors present in such a quick and easy dish! Thanks again for your thoughtful note and I hope you enjoy your lunch! Hi! I came across your recipe on Pinterest. It looks amazing! I fell in love with Khao Soi several years ago when I visited Chiang Mai, Thailand. It is there “signature” dish, and is influenced by the neighboring Burmese culture as well. I thought I died and went to heaven!I I ordered it every time it was on the menu, and at every local vendor! So amazingly delicious!! Once I returned home, I spent the next couple years searching on-line for any and all Thai restaurants in the states that offered it on the menu. Very hard to come by!! It’s because most Thai resaurant owners come from Bangkok, and aren’t that familiar with it nor want to go to the bother of making it! (I got this response from several!) Anyway, one simple step you can add to make your recipe more authentic would be to deep fry some of the noodles!! The regular noodles are added to the bottom of the bowl, and the crispy fried noodles are added on top! It adds another dimension of flavor and texture and should definitely not be left out. Happy Eating! Hi Vonda! Thanks so much for sharing your knowledge and experience! I have also noticed that it’s rarely on the menu in the States – so it’s very interesting to find out why that’s so. Even still, it’s such a wonderful dish, you’d think they would go to the extra effort to make it as I’m sure it would be a big hit! Thanks for the crispy fried noodle suggestion – I will definitely try that the next time I make it! As you said, it sounds like it would add yet another wonderful layer of flavor and texture! Gave this a try tonight and fell in love! Learned some new technique in the process. BONUS! Next time I may use lite coconut milk to reduce the fat content just a bit. With the exception one thing that makes me VERY nervous, this recipe looks simply awesome. I can’t imagine anything calling for a TABLESPOON of turmeric. A TABLESPOON? You’re sure? Hi Diane! Thanks for the question. Yes, it’s a tablespoon of turmeric – if you’re concerned about the mildly bitter taste, it actually balances out quite nicely when paired with the sweet and rich flavors in the dish. Suffering from a cold, I wanted something spicy to kill those germs and make me feel better. I made this yesterday and it was delicious, and beautiful. The only change I made was adding shitake mushroom and I did not remove all of the seeds from the chiles (I actually wish I had left more seeds in.) I don’t know if it was the lemon grass itself or something I did, but there wasn’t a lot of flavor in the lemon grass water (living in the LA area, I had to go to 4 stores to find lemongrass, go figure). It was the type of lemon grass that was already cut and put in a little plastic package, which might have had something to do with the lack of flavor. I doubled the recipe and cut down on the chicken by about 1/2 lb. As condiments, I had sliced jalapenos, cilantro, mung beans and as I write this, I realized I forgot the limes. It’s a good thing I doubled the recipe because I had one bowl, went to bed and its all gone this morning. I guess the other 2 family members liked it!! Thanks for a great recipe (which I found on Pinterest). Oh, Cherie I hope you’re feeling better! I always crave spicy soups when I’m sick too! When I’m not feeling well the hotter, the better – so leaving the seeds in to suit your spice level is perfect! I’m surprised you had to go to several stores to find lemongrass in the LA area. Kudos to you for being such a trooper, especially while under the weather! Honestly though, the lemongrass water adds just a subtle note to the soup, so feel free to omit it next time if it’s too difficult to find. I’m so glad you (and your family members) enjoyed the dish! 😉 And thank you so much for your thoughtful comment. Hope you feel better soon! Judging what you created with the Panera vegan soup – I can’t wait to see how you veganize the Thai curry soup! oh my goodness .. I love Asian food. . this broth looks amazing!!! I can’t believe everything can be done in about 40 minutes! Can’t wait to try this! I’m all over noodle broth bowls! This soup sound amazing, and I love the color! Thanks for enlightening me on turmeric…I didn’t realize there were two different varieties. Your photos are as gorgeous as usually! The curry soup is so rich and full of flavor, the type I enjoy the most 🙂 I have turmeric powder, not sure which type it is, but will give it a try! Aww… thank you, Maggie 🙂 I’ve tried this soup with various shades of turmeric, and they’ve all been fantastic – I hope you enjoy! I have never had this kind of soup before either, but I can just tell from the ingredients that I would LOVE it! Your photography is so stunning… Pinned! Thanks, Allie 🙂 I think it’s become one of my husband and I’s favorite soup/noodle dishes. Love Thai food and this is one of the best looking Thai soups I’ve seen. This looks amazing, but where could one find Thai chilies? I love the vibrant colors of this curry soup and I bet it tastes delicious! Never had Khao Soi either. Looking at the ingredients, I think I should try it very soon! Never knew there were two types of turmeric powder, I think I have a lighter color at home. Thanks, Mira! I hope you give this a try – it’s so delicious and so easy to make! I certainly didn’t know there were 2 types of turmeric powder, Kathleen! But I love the rich deep colour it gives to dishes. When I visited Thailand, I couldn’t get enough of these kinds of dishes. Love that yours seems ‘achievable’ with not too many ingredients in. Yes, I didn’t know turmeric came in varieties either! From what I’ve read, there are actually quite a few different types, I only mentioned the 2 most popular. This sounds sooooo good! I love Thai food, so I’ll have to try this. Learning that there are different kinds of turmeric was very interesting – I had no idea. I’ve never really seen the pointy of the kind one generally finds at the grocery store, so I’m going to order some of the other. Thanks for sharing that information. OMG I LOVE THIS!!! PInning and MAKING! Absolutely fantastic! Thai is one of my favorite cuisines. I’ve never made Thai soup at home, but I really want to try this recipe. Looks incredible. THIS looks absolutely amazing! I’ve been to Thailand twice with both times being around Southern Thailand. I’ve always wanted to go back and visit Chiang Mai or any Northern cities/towns. It’s almost 10AM here in NY, and I would much rather have THIS than a cold bagel. Thanks, Kayiu! Everyone I know who has lived in or traveled to Thailand has had nothing but wonderful things to say – it’s definitely on my short-list of places to go. I would love to eat my way through the country. You have a way of making me hungry whenever I visit your blog!! This soup looks incredible!